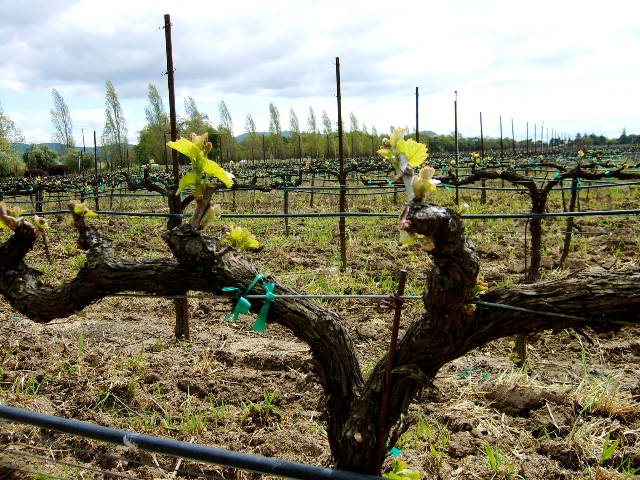 Napa Valley is wonderful in the springtime with the first leaves on the vines giving a lovely green liveliness and the lack of crowds really makes it almost perfect. 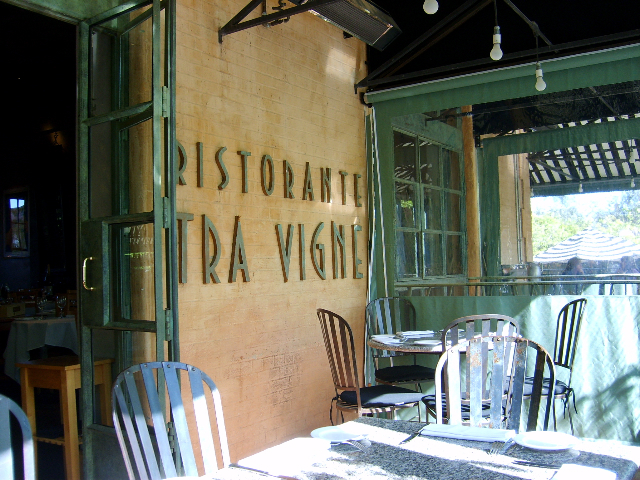 The sun helps too, and we found some at the outdoor patio of Tra Vigne making for an extremely joyful lunch. There are few places to hang out on a lazy wine filled Sunday more pleasurable than Tra Vigne in St. Helena, and this visit will be remembered fondly. Jay Smith, the Wine Director at Tra Vigne knows his stuff and has created a fun and vast list of top Napa Valley gems along with a fine selection of Italian regional wines of which I sampled with my panino and awesome fresh local mozzarella on crusty bread with a rosemary sprig, how can something so simple take your breathe away? Of course, Jay brought something special to taste, that being the new release of 2005 David Arthur Cabernet Sauvignon, Napa Valley, and all I can say is thank you Jay! This vintage has smooth chocolate-like tannins and perfect fruit balance which make it a winner right now and with any luck get even better of the next 5-8 years. The finish was amazing with savory currants, cassis and tangy blackberry lingering on and on. As for the Italian vino at lunch, there was an impressive Feudi San Gregorio Falenghina, a bright and pleasing Tebbiano, a fruity and lush Primativo and a blueberry and vanilla laced Nero D’Avola from Sicily that was the star. Tra Vigne has remarkable olive oil and fresh produce that makes everything taste great! Whetting the appetite driving into Napa, knowing that an Italian lunch lunch awaited, we did a drive by Luna Vineyards and sampled their Pinot Grigio and Sangiovese and looked out across their vines, it was an inspired choice and the wine tasted even better for being fresh on the palate with good mouthwatering acidity and bright flavors of spring. Back in the car we raced out the Silverado Trail and up to Stags’ Leap District to check out Cliff Lede Winery at the former site of S. Anderson on the Yountville crossing. Cliff Lede has made a big splash with this property and with David Abreu and Michel Rolland consulting for him, he looks to keep turning heads. Lede a Canadian businessman and rock music fan has spared nothing money-wise to build one of the best winery’s in the Valley, and the wine is right up there with the top echalon. Cliff Lede inheirited some of the S. Anderson sparkling wine which they continue to pour at their tasting room, and this of course was a great palate cleanser before driving into the Cliff Lede reds. The sparklers were very nice and well made with a real Champagne feel to them, but I was there to lose myself in the Cabernet and was luck they have a few bottles left of their wine! They produce a wonderful Claret, one of the best Napa values ever and a choice of three limited production Cabernet Sauvignon based wines, all of which will blow your mind, though sadly they sell out fast. I sipped on their 2004 Cliff Lede Cabernet Sauvignon Diamond Mountain, Napa Valley of which is only sold at their tasting room. This Cabernet has wonderful intense mountain fruit and powerful tannins all done with finesse and sublime care. The black fruits, spicy red currant and plumy body are hedonistic and the finish is long and vanilla filled. And now for the silliness, as a wine professional and as someone that can usually find the hidden gems while flying under the radar, can for the most part avoid the garish and Disneyland-like places with posers and snobby-types, but I walked right into my worst nightmare with a smile. 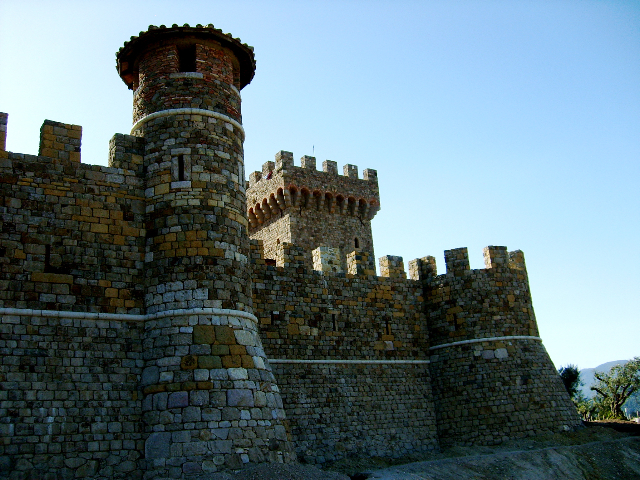 Castello Di Amorosa, the newest brainchild of the V.Sattui empire, looks like a castle plucked right out of Tuscany, though it looks more amusement park than Siena. At first with good humor I approached, but this faded into terror and disgust fairly quickly, almost the same feeling I get entering a Costco! There is a big attitude in the air here and it kind of sends the wrong message and I personally did not like the tacky buy a ticket to ride game they force on you here, though for some it might be okay. I just am not big on buying a ticket and being herded into a pre-paid pen, but I will say the place was packed and the cash register was singing away. 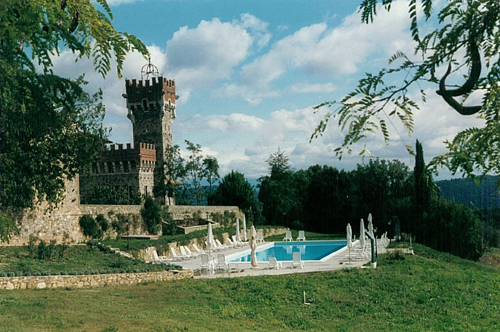 Just because I kept thinking about Pirates of the Caribbean instead of Super Tuscan style wines doesn’t mean you won’t love the place, sorry I mean Castle, oh my I mean Castello! It made me really want to go back to Italy and the real hills of Chianti, so that is what I’ll save for for. After Casello di Amorosa, I felt the need to clear my mind and refocus on the beauty of the day and of Napa, so I took the Oakville grade over the mountains, enjoying the amazing vistas and stopping for wild flowers in bloom, now this is my kind of Napa and I was refreshed and happy again. There is something special seeing mountain vineyards, nature, and the quiet that makes me profoundly happy, and you can still find it in Napa, even if you will be subjected to some silliness too. The Twelve-hour flight helped build the anticipation and I couldn’t sleep a wink on the Lufthansa red-eye to Florence. I had dreamt of Italy all my life and now I’m finally going to be there, not just Italy, but Florence the romantic heart of Tuscany. Florence is a beautiful city and it was just magic to walk from palazzo to piazza and to museo. 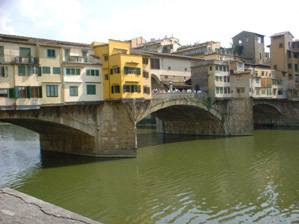 The Duomo and the Ponte Vecchio were just as advertised, nothing disappoints here. I had heard terrible stories of crowds, gypsies and litter, though no of these were in evidence to the extent of any problems. I guess with all the art and history on display, I only saw Florence’s lovely side and enjoyed every minute. In fact the only thing I can remember being annoying was the buzzing of thousands of vespas, and that even didn’t matter much. I was looking forward to my first night in Italy, and it was made all that more special that the Antinori winery was treating me to dinner at the La Cantinetta Antinori, their bistro at their family Palazzo di Antinori. The Antinori family is distantly related to the Medici Family the former rulers of Florence and Tuscany, and are thought of as Italian royalty. I must say the Caninetta was simple in appearance, but amazing in service and quality. The evening was very special and one of the best wine nights I ever had, with some of the finest Tuscan wines available. The tasting started with antipasto to die for, with their estate olive oil drizzled on everything including my shirt. The wines kept coming almost the entire Antinori lineup from their various estates. The only white was a crisp and lively Vermentino from Bolgheri that cleaned up my palate and left me mouthwateringly ready for the impressive reds that were to follow. The night went in a blur of fantastic food and stunning wines, but here are the highlights of the wine. 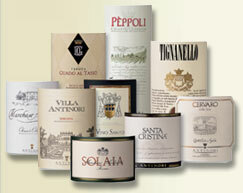 Peppoli Chianti Classico, Tenute Marchese Antinori Chianti Classico Riserva, Guado al Tasso Estate Bolgheri rosso and the famed Tignanello “Super Tuscan” red. Whew, the time just flew by and my head was spinning as I sat back with desert and vin santo and a double espresso waiting in the wings just to make sure I could find my way back to the hotel! Lucky for me it was only three blocks away, sadly it didn’t give me all that much time to reflect on my first meal in Italy. I awoke surprisingly refreshed and stepped out onto the hotel’s rooftop terrace and enjoyed the finest cappuccino I’ve ever had, made for me by a man in a elegant uniform that I had mistook for a submarine captain. As I sat at my small table in the sunshine I smiled at the view of terra cotta tiles and church towers, yes Florence is wonderful. 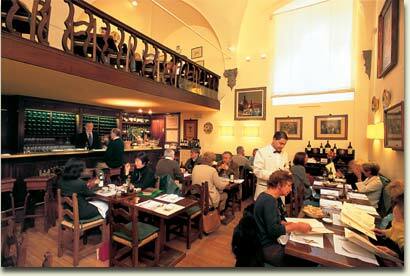 Read Dante, view Michelangelo and drink Antinori and you’ll just start to understand this beautiful historic city. Next up was touring the ancient hilltop towns of Tuscany by rental car. Again I was very lucky that all those horrible tales of mad Italian drivers and terrible medieval roads proved not to be the case. OK, I do admit that the line at the rental car place was frightening as was driving out of Florence through impossibly narrow lanes, but once out of the city it turned to pure joy. The roads were excellent, the drivers courteous and the road signs easy to read, please I’ll take this over trying to get around San Francisco or LA anytime! I just made rules for myself, never ever drive into a walled city no matter what the guidebook says. Trust me on this, because I had read that Lucca had quote “wide Roman streets that are easy to navigate” Sure, I drove in and promptly turned onto what was promised as a main avenue, in reality it was a pedestrian walkway barely wide enough for the tiny VW I was driving. To make it absolutely perfect, it was pouring rain and packed like sardines with people! I quite literarily had to push the mass of humanity along as I in almost a complete panic attack found a way out. Finally I found a side lane where luck would have it there was a police car full of laughing policeman that very nicely escorted me to my hotel, it made me wish that I understood Italian, because the parting words were lost on this guy, but I’m sure they were hilarious. So never break that rule, even though I almost drive into San Gimignano through the back entrance to the city of towers, but at the last second I braked hard and reversed out scaring the hell out of German family in a Mercedes as I went blazing by backwards at 45 MPH. Those streets were so narrow that vespas had to fold their mirrors to get through. I stayed in a beautiful villa in the small commune of Bucine; the place is an olive oil and wine estate named Tenuta di Lupinari, set in the Eastern hills of Chianti. Seven days and nights of Heaven, that offered a castle view with the rising sun to wake up to every morning. The estate produces easy drinking Chianti that went great with the local menu, but Tenuta di Lupinari’s star is their olive oil, which is flavorful and cloudy green and very full bodied. Foodies listen up, I found a gem, with some help from couple that were staying at the villa, from San Francisco bless them. 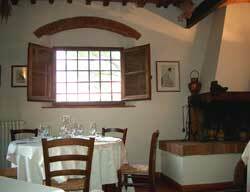 The best meal in Italy was had at Osteria di Rendola, a fabulous restaurant in the little town of Montevarchi. The place was amazing and the food was out of this World, the best of show dish was a porcini mushroom risotto with buffalo mozzarella and avocado cream. Of course they had a great wine list, but I went for their own wine a Cabernet Sauvignon bottled just for them. I had been drinking local Chianti and other Sangiovese based wines, so I was curious to try the Cab. It was lovely and fruit driven with big flavors and good depth. This was as good as most $50.00 Napa wines, so I was even happier to find, even though this was not a cheap place the Cab only cost $25.00, this was a great evening meal. The other highlights were the visits to Cortona, with its Etruscan tombs, Siena with its huge fan shaped Piazza del Campo and the harvest of grapes in Montepulciano. Before leaving Tuscany behind for Portofino and Milan, I had to drive though and explore Chianti Classico. The beautiful Radda in Chianti was a wonderful place to spend the afternoon with its tiny Piazza and cute little shops including a wine shop offering for sale and taste some of the finest small estate Chianti’s. Lunch in Radda was great pleasure and humorous. The place Villa Miranda; is a little roadhouse that is run by an old woman and her family. The food was fresh and vibrant that delighted the senses, the homemade ravioli in sage butter sauce still lingers in my mind. The funny part was the wine service, I thought a light white would go with the food ordered, but I found this was just not done in Radda. The troll of a woman brought me a half bottle of ancient Villa Antinori Chianti Bianco that was brown in color and totally cooked with a label that was bleached out by sitting on a window sill for ten years. Totally undrinkable, but the food was so good I didn’t even send it back. I got a good chuckle out of it and hell I was sitting outside overlooking the gorgeous hills covered in vines, Villa Miranda gets mixed reviews for quality and service from travel books, I was lucky I guess. When in Radda please drink Chianti Classico, I learned my lesson the hard way.